By now, it's unlikely that there's anybody left who doesn’t know South by Southwest, or at least its shortened name, SXSW. Since its inception in 1987, the festival has come a long way, becoming one of the biggest and most important annual events in the world for all those in the music industry. But once you hit the top, where else is there to go? How large can an event grow before it crushes under its own size? There's still a lot of room for growth – and more importantly, change – and here's what's likely in store for SXSW's future. Over the decades, SXSW has grown by leaps and bounds, and a lot of that is thanks to the money that comes from big-name brands that want to attach themselves to the ultimate underground coolness that the festival seems to have in spades. As more and more brands got involved, the festival's indie cred began to take a hit, and year by year, those who knew it for what it used to be have started leaving it off their annual festival visits. Things hit a breaking point last year when Doritos hired Lady Gaga to perform, and every mention of the show in the press made sure to include the snack's name. While this may sound like a big return for the chip-maker, it has sort of become a joke. Combining the world's biggest pop star and one of the most recognizable and well-funded brands isn't exactly indie, is it? 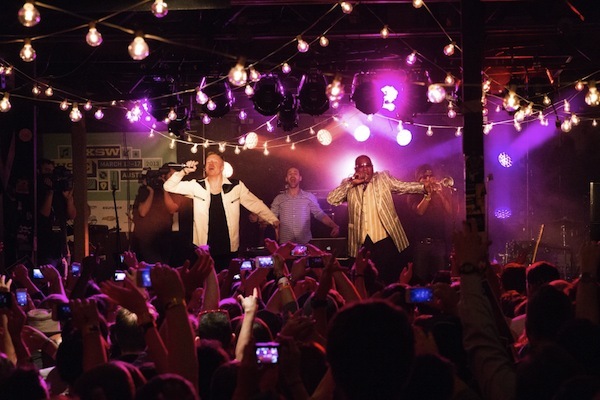 Billboard's Andrew Hampp published a piece just before the music portion of SXSW began this year saying that last year's festival "marked a turning point for the Austin conference – and indeed, for large-scale music confabs as a whole." Brands will still be a big part of the shows, but they'll have to watch how they market themselves more closely, and festival organizers will have to be more selective of who they allow in, and how many brands are permitted to advertise. While plenty of people attend SXSW just for the bevy of shows that happen all night and every night, the festival is also one of the music industry's most important conferences. There are dozens of panels and hundreds of people from every walk of the business mingling in sessions and happy hours. If you're smart about how you spend your time, you can meet quite a few valuable contacts, and organizers are working on emphasizing that portion of the event, as it's one of the things that the hundreds of other festivals around the world can't offer to the same extent. In the SXSW GO app that was released for this year's festival, programmers created a feature that tapped into over 1,000 beacons spread throughout Austin to tell you exactly who was around you at that moment. This makes networking at shows and bars a lot less random, and it means you can get even more out of your visit. For years, just having a presence at SXSW was enough for most brands, but as the relationship between the festival and corporations has matured, companies are looking to do things a bit better these days. There are now more opportunities for smaller groups to make a few extra dollars, thanks to brands who want to seem cool and "in the know." Plenty of massive companies are now looking to blogs and music experts to help them find who's next, as opposed to who's now. Sure, there are still plenty of examples of brands that are only looking for the most popular of the most popular (Samsung this year hired Iggy Azalea, ASAP Rocky, and Hot Chip for its showcase, for example), but a plethora of others want to help cultivate new acts, if only at SXSW. While the music portion of SXSW may have hit a ceiling for how large it can get, that doesn't mean the brand is done growing. Music is where the event started, but since then, it has expanded into so much more. The Austin-based interactive and film festivals are also on the rise, bringing in plenty of money and thousands of attendees. In addition to the film festival and a business-oriented interactive portion, the people behind SXSW have recently founded an education conference and another focused on eco issues. While some of these festivals grow in importance, it will be interesting to see what else SXSW does, including moving into different topics (design? fashion? ), or perhaps even different countries. Were you at SXSW this year? What do you think is next for the festival, or what would you like to see added in the future? Let us know in the comments!